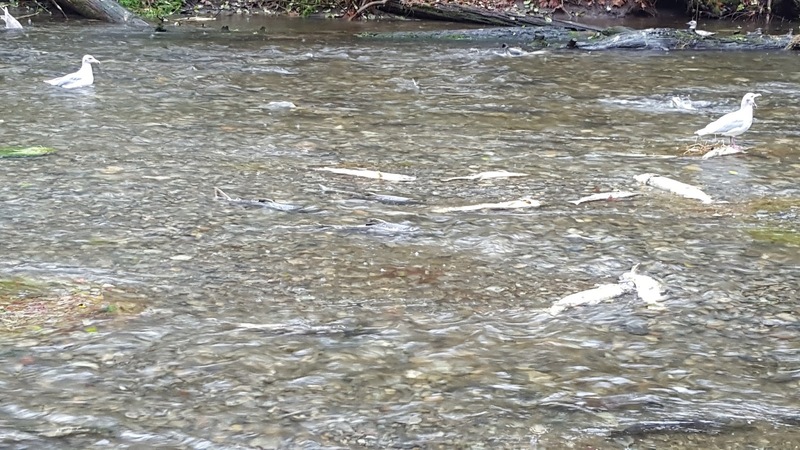 It's been a while since I've last blogged. 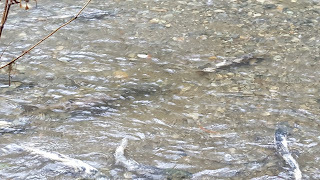 A lot has happened since then, most noteworthy was our move from my birth province of Saskatchewan to British Columbia! There are a lot of differences between these 2 provinces but that is another post for another time. 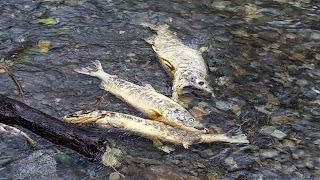 One of the most amazing things I've been able to experience since our move was to experience my first ever Chum Salmon run at Goldstream Provincial Park, an approximate 30 mins drive from our place in Victoria. 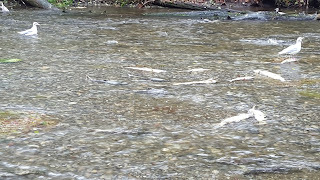 I had an idea what it would be like but never expected how shallow the water would be and how many dead fish there were :( Reading about the salmon run on Goldstream Provincial Park's site revealed that it is normal for the fish to spawn and die, a fact I was not aware of. Apparently the salmon run lasts approximately 9 weeks so I would highly suggest checking it out if you have never experienced it yourself. 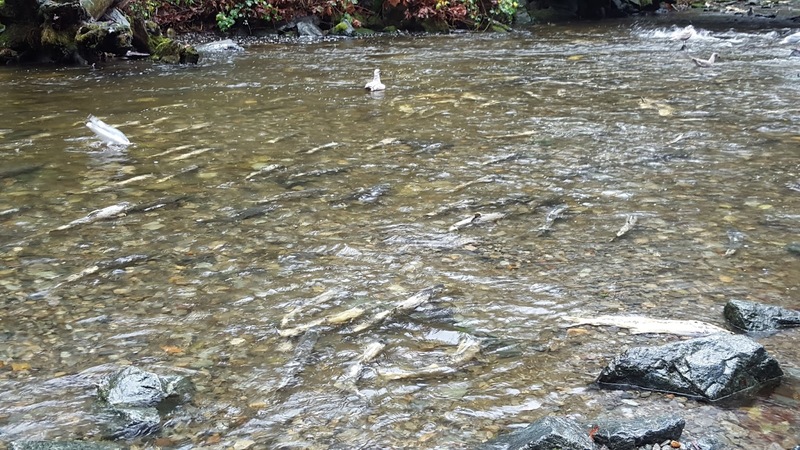 Just seeing the shear number of fish was astounding and seeing how much effort they have to go through to fight against the current was eye opening. 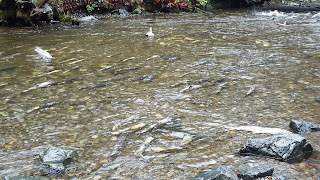 I'll save you the minute details about the salmon run as the site I linked to above does a thorough job at describing the process so I'll leave you with a few pics and a short video (apologies for the quality as it was raining out that day). Friday evening after work, after a few pints and games of darts, my husband and I decided to venture out for some food. As we had our fill of liquids we didn't want to go anywhere that would be too filling. As it turned out, we stumbled upon Bodega Tapas and Wine Bar, located at the end of the historic Trounce Alley, known for it's wine and tapas. As it turned out, it was the perfect spot. This bar is the sister bar to The Tapas Bar which is right next door that opened not too long ago. It's a tiny bar with one row of tables along the one wall and the bar opposite to it. Near the entrance are a few additional tables but overall it is not big by any stretch and that was fine for us. The decor is rustic feeling with a mix of wood and wrought iron furnishings, presenting itself somewhat as a high-end bar and the music wasn't over bearing. Being a Friday night the vibe and ambiance was perfect to kick back and relax while nibbling on some tapas. It's interesting to note that this bar has no formal kitchen area hidden behind a doorway. The bar area is shared between the 2 chefs and bartenders that night. To one side is the prep area where the chefs cook items on what looks like an induction stove and keep food warm in a convection oven. They do all their prep work in front of you while the bartenders serve drinks beside them. Their website offers appetizing photos of their offerings as well as their menu, location and contact info - all of which are easy to navigate. The restaurant also has a Facebook page to follow them on where they post specials of the day though not too frequently. I couldn't find any other marketing efforts outside of their website and Facebook page but it doesn't seem to be hurting them. Sitting at the bar we had great service. The bartender was attentive even while the place became busier as the night went on and he was more than willing to answer any questions we had. It felt in the beginning they were overstaffed but as the place filled up it was obvious they had the right amount of staff working. overly large but allows you to select more than one item ideal for sharing. 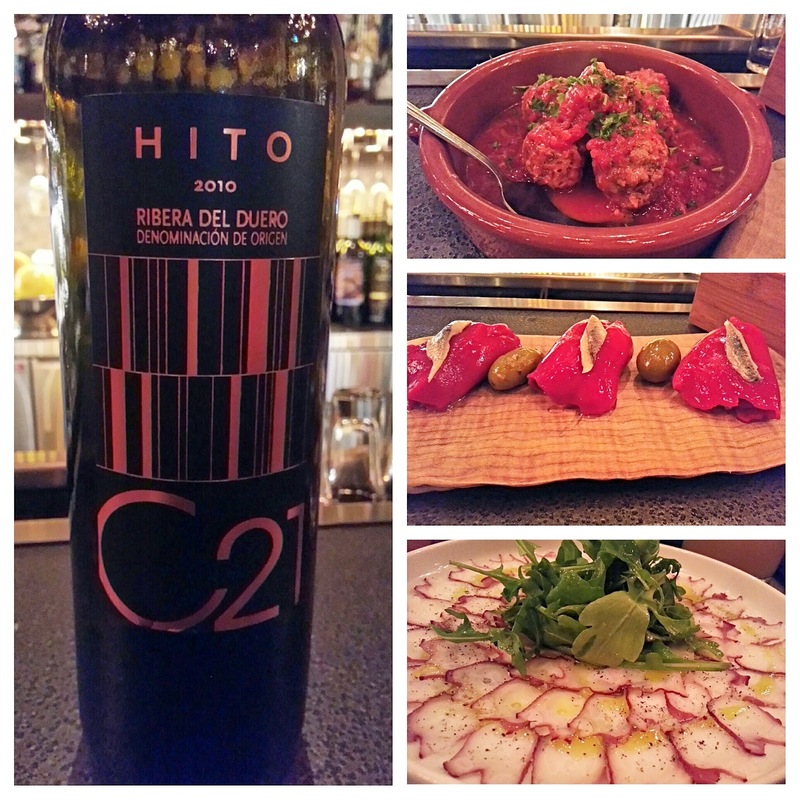 That night we chose to have the Fennel Orange Salad, Carpaccio Del Pulpo (which is octopus), Stuffed Piquillo Peppers, and Albondigas De Cordero (local lamb meatballs). Everything arrived in a timely fashion and was quite delicious. Our one comment would be that the arugula salad that comes with the Carpaccio Del Pulpo was slightly over seasoned. Overall everything was tasty and well prepared. Being a tapas bar, I felt it was reasonably priced where you could order more than one item and not feel like you broke your bank account. The prices ranged from $7-$14 which I felt was reasonable. My first experience here was an enjoyable one where I can see us coming back again. I would recommend this to anyone looking for Spanish tapas and a place to relax.